We finally got to land again today. 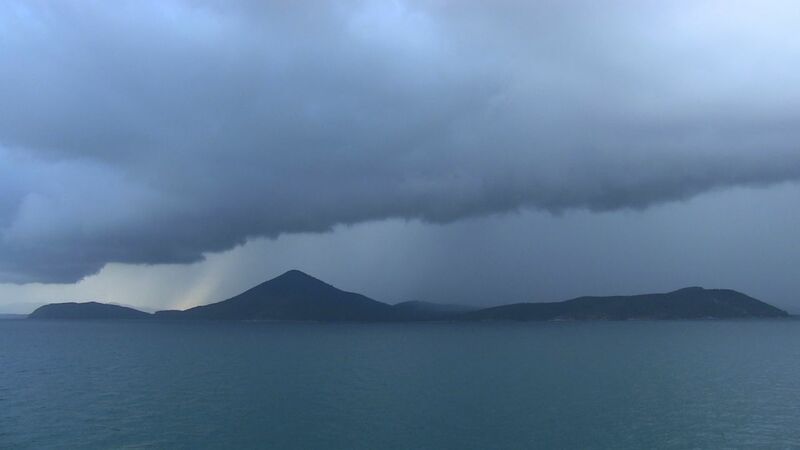 Cooktown is a town of about 2,000 people that was founded at the bay where Captain Cook landed to repair his ship after it had run aground on reefs to the southeast. Ray's back was bothering him this morning, possibly a strain from the rough seas a few days ago, so I went off on the tour without him. 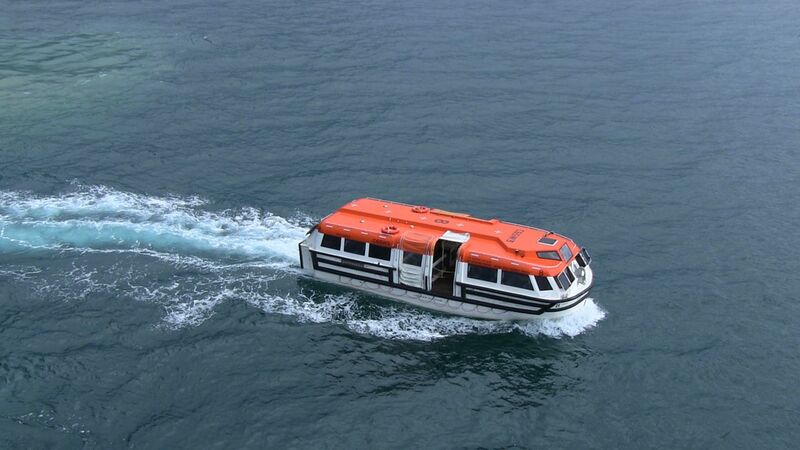 We had to take tenders in because the bay is too shallow for a large ship to get in. The tender ride was a long one, over a half hour to shore. The first thing I saw as I left the dock was the sign shown here. As our guide explained during the morning tour, they are not kidding. 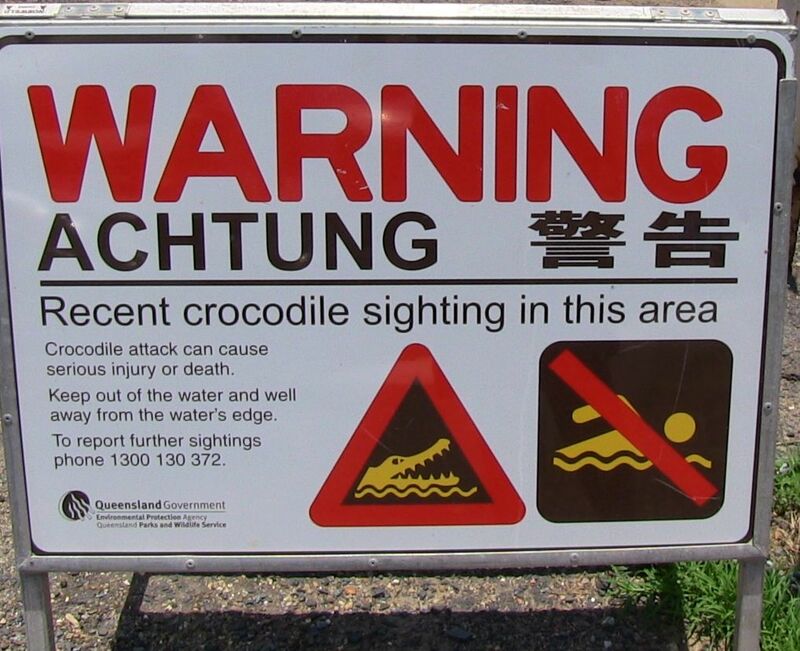 It seems that there are vicious salt water crocodiles in the area and no one goes in the water. He told a few gruesome stories of fairly recent crocodile attacks. He also talked about all the varieties of snakes, including pythons, that inhabit the surrounding bush. I decided that this is not the area of the world I would like to live in. Once on shore I boarded a little bus holding about 20 people for a tour of the town. Our first stop was the James Cook Museum. This building was originally a convent and Catholic school. After the nuns left, the building fell into disrepair. It was later put on the list of historic buildings, restored, and made into a museum of Cooktown history. Each room in the museum documents a different episode in the history, such as Aboriginal life, Cook's landing, the gold rush, the Catholic church and school, and Chinese immigrants. The tour went to a botanical garden and wildlife interpretive center next. I enjoyed the interpretive center but avoided the garden after guide warned of a heavy mosquito population. The cruise director had warned about the heat so I was prepared with hat, suntan lotion and water, but didn't bring my bug spray or mosquito netting. I think from now on they will be standard equipment in my shore bag, just to be safe. The last stop was to a lighthouse on the top of Grassy Hill. From there we had a great view of the town and harbor. It seems that Captain Cook surveyed the area from this point when he arrived. 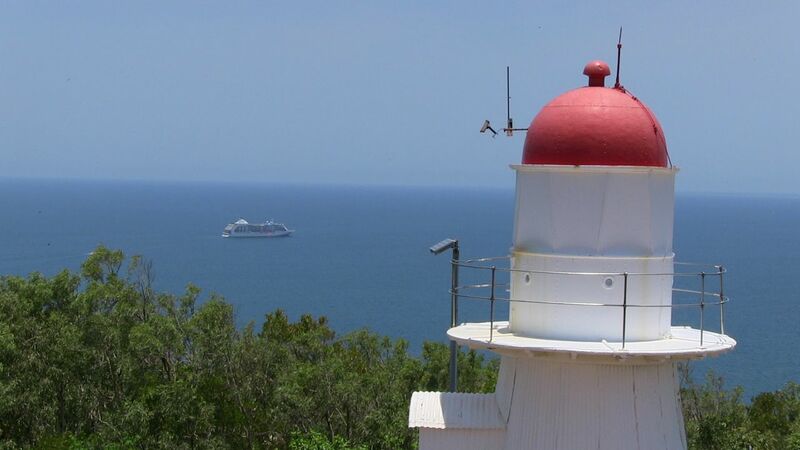 I got this shot of our ship from the viewing platform next to the lighthouse. There wasn't much else in town, other than the fact that most of the buildings are on the historic register. The ship was scheduled to weigh anchor at 4pm, and it's a good thing. A thunderstorm started building about 3pm and the last tender made it back just in time before the rain came. We stood out on the balcony and watched the lightning on the shore. Tonight the upstairs restaurant that is usually Italian is serving Indian food, so we are eating in the main restaurant downstairs. The menu selections there aren't what our choices would normally be either, but they have a few simpler choices on the always available selections.